When I was building my desktop PC, I omitted a DVD or Bluray drive, since I don’t have much use for such a device these days. I’m not sure whether it is possible to install Windows via USB, but there is a really simple method for Linux that can be performed even by users who have never seen a terminal window. 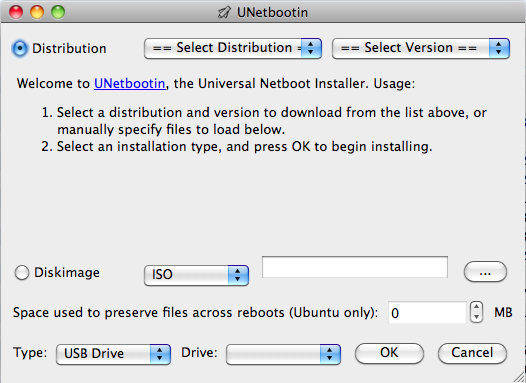 You can even download a Linux ISO from within UNetbootin. Afterwards, you only have to select the USB device you want to use and click “OK”. To boot from USB you might have to change the boot order in the BIOS, though. My installation of Xubuntu went without any problem. Within about 15 minutes I was able to use my computer productively. There are quite a few needlessly complicated tutorials on booting from USB out there, making use of the command line tool “dd”, with which you might accidentally wipe our your hard drive, so you’re probably better off using a simple and straight-forward solution like UNetbootin. This entry was posted in Hardware on January 18, 2014 by Gregor Ulm. I’ve been using a laptop as my main and only machine for many years now. My current laptop, a trusty aluminum Macbook, turned five recently, and is still going strong. Yet, I thought it was nice to have a backup machine at hand, for the sake of convenience, and in case my laptop breaks down, which is only becoming more likely. I ended up with a reasonably powerful machine that cost me around 240 GBP, which was much less than I initially anticipated. The last time I built a computer was in early 2000. The most expensive component back then was the NVidia GeForce 256 graphics card. Taking inflation into account, the PC I built was cheaper than the GeForce 256. I’m not a PC gamer, and therefore I wasn’t concerned with building a gaming machine, even though I will point out a relatively cheap upgrade later on that would turn this build into a decent mid-range gaming machine. 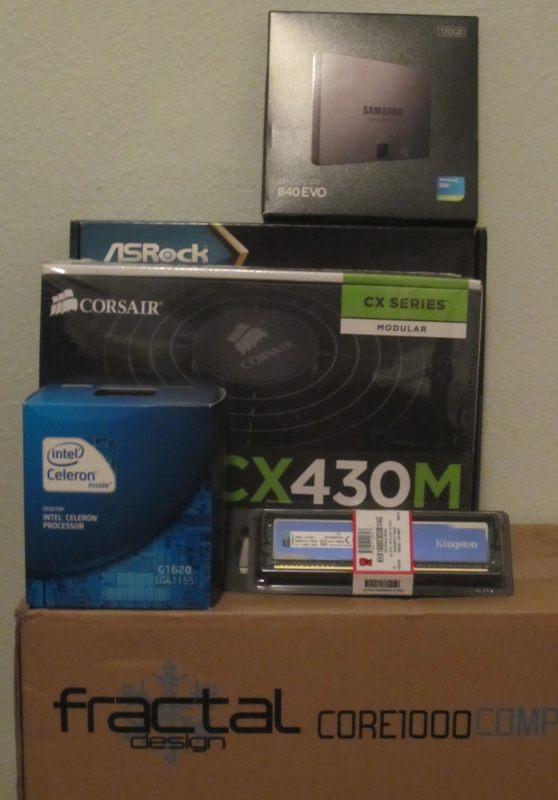 Instead, my intention was to build a Linux workstation. I spend most of my time in gedit and Emacs, depending on the programming language, and Firefox. Furthermore, the little browsing I do is rather text-heavy. Probably the most taxing thing I did on my laptop this year was running algorithms I had yet to optimize for Tim Roughgarden’s Design and Analysis of Algorithms online course. My goal was to set up a Xubuntu environment. Xfce is lightweight and fast, and Ubuntu enjoys great support. I’m currently running Xubuntu 13.10 without any problems. The next version is Xubuntu 14.04 LTS, which I intend to upgrade to, and then keep using until the next LTS release is out. I sourced all components from Amazon.co.uk. They offer free delivery, and if there ever is anything wrong, their customer service is great to deal with. Unfortunately, I’ve occasionanlly had a less than stellar experience with some of the third-party sellers on Amazon, so I prefer buying directly from Amazon, even if some other seller offers the same product for a few pounds less. The headache is just not worth it. In total, the cost was slightly below 240 GBP, which strikes me as astoundingly cheap. Some of the components are maybe a bit extravagant for a budget PC, so if you’d chose a basic PSU and a regular HDD, you could shave off 50 GBP or so, which would result in a highly affordable machine. You might wonder why I didn’t buy a graphics card. Well, the Intel CPU comes with “Intel HD Graphics”, making a dedicated graphics card for non-gamers superfluous. The internal Intel GPU is probably sufficient for casual gamers. I’d be very surprised if Minecraft, or some older games like Team Fortress didn’t run perfectly fluidly. I won’t make a guess about the performance of Crysis, though. On a side note, the Celeron G1620 is able to power up to three screens — but not with the budget mainboard I got. When Intel released the first Celeron chips well over a decade ago, they had a bad reputation due to their poor performance. The current processors in this series, though, are basically slightly crippled i3 processors, and therefore they are reasonably powerful. That’s certainly true under Linux, but it may be different under Windows or Mac OS X, if you’re thinking about building a ‘Hackintosh’. I was certain that even the weakest Intel CPU would be good enough, based on my experience running Linux on a machine with 256 MB for years. In fact, that machine was more responsive than any Apple or Windows machine I ever used. Granted, I don’t really need a lot of CPU power. I’d say if you don’t play games, or dabble in multimedia, then spending money on a more powerful CPU is a waste of money. Frankly, for any non-gamer a ten-year old machine with Linux and 1 GB of RAM would suffice. We’ve long reached the point where hardware is really fast enough for typical usage scenarios. The fact that hardware is fast enough is one of the better kept secrets in the technology press. Sure, new hardware is more power efficient, but if you can resist the Microsoft marketing machine and go for Linux instead, you will find very little reason to upgrade your machine at all. There was an interesting article I came across on Tom’s Hardware: Is This Even Fair? Budget Ivy Bridge Takes On Core 2 Duo And Quad. Equally impressive is how well the Pentium G2020 performs, outpacing the E8400 by 21%, despite a 100 MHz-lower clock rate. That’s a solid showing for a $50-65 chip, even if the lack of overclocking support means you’ll never get anything extra out of it. In short, the cheapest CPUs Intel sells today can compete with high-end CPUs from some years ago. There is more than just the low price that’s an advantage of that CPU. Power consumption is also very low, so the stock fan Intel puts in the box is sufficient. Long gone are the days were your PC would heat the room. The mainboard is once again a product taken from the very low end. It offers two USB 3.0 slots, but only supports SATA II. Further, there are only two RAM slots available. I figured that this should still be plenty. I’m using only one RAM slot, which holds a 4 GB Kingston module. While Apple OS X users and Windows afficionados may now shake their heads in light of my supposed ignorance, it really is the case that a typical Linux installation is very resource-friendly. It seems that OS X requires over 2 GB of RAM just for itself, and once you open a few applications, you’re using four or five gigs of RAM. In comparision, after booting, memory consumption of my Linux setup, using Xubuntu, is at around 220 MB. We’re talking about a staggering difference of one order of magnitude. Keeping a careful eye on the resource monitor, I’m pleased to say that I have yet to use more than 2 GB RAM when doing work comparable to what I do on OS X. RAM consumption normally hovers around 1 GB. I wish OS X was that resource-friendly! By the way, a downside of the integrated GPU in the Intel CPU is that it reserves 256 MB RAM for itself. I thought that this might lead to problems, but Xubuntu uses so little memory that the 4 GB, minus the fraction that is reserved for video, seems rather excessive. The most expensive component is the SSD. Sure, you could save quite a bit of money by choosing a regular HDD, or get a 2 TB drive for a comparable price. I have not use for that much space, but on the other hand I do value the advantages of an SSD. It just makes working on a computer so much more enjoyable. After you’ve gotten used to your system booting as well as shutting down in 15 seconds or less, and applications launching anywhere between instantly and a few seconds, it’s hard to go back to a regular HDD. The last paragraph leads to discussing my subjective experiences. After putting all parts together, I installed Xubuntu via an USB stick, in case you noticed the absence of a DVD or BD drive. Within a few minutes I had a fully functional operating system. After some more minutes I had installed all the other programs I use. This was more convenient than installing OS X or Windows, and not just because it took a lot less time. This PC won’t impress with its benchmark results, but let me just take a page out of the Apple PR handbook and state that while the benchmarks may not be great, the entire system nonetheless “feels” fast and highly responsive. Heck, I’m quite certain it feels much more responsive than a Mac Mini that costs three times as much. As an illustration, my screen takes a couple of seconds to warm-up from standby, and when it’s ready, the first thing I see is the login screen. Noise is pretty much a non-issue. My Xbox 360 Slim, by no means a loud machine, is noisier. The PC is humming along nicely. Amusingly enough, if the fans in my Apple laptop spin up, they drown the noise of the PC. 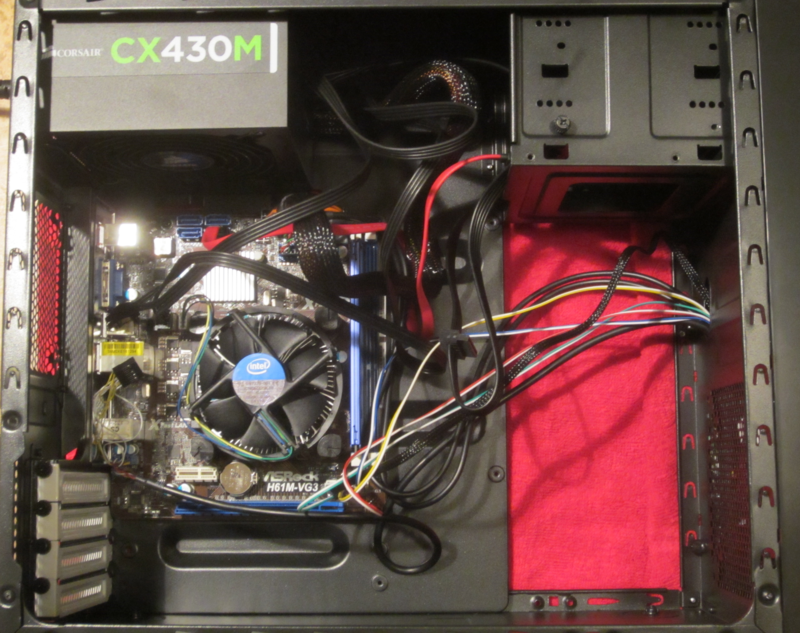 By the way, the case comes with a fan in the front, which could probably be disabled, at least in my setup. So, there you have it: a quality PC for less than 240 GBP. For anyone wanting to use a computer not primarily as an entertainment device, the PC I built would be wholly sufficient. If you want to play games, you can throw in an AMD Radeon HD7750 for 70 GBP. This card is even available in a passive version with a heat sink instead of a fan. With this upgrade you’d have a decent mid-range gaming system, presumably blowing the PlayStation 3 or Xbox 360 out of the water. If cost is an issue, pick a cheaper hard drive and PSU, and you’ll get a gaming PC with a decent graphics card at a great price. This entry was posted in Hardware on December 4, 2013 by Gregor Ulm.